I very rarely read funny books. I seem to be drawn more to angst than humour but sometimes it is well worth making an exception. Especially when all of the Northern Book Bloggers are mad at you for not yet reading a book. 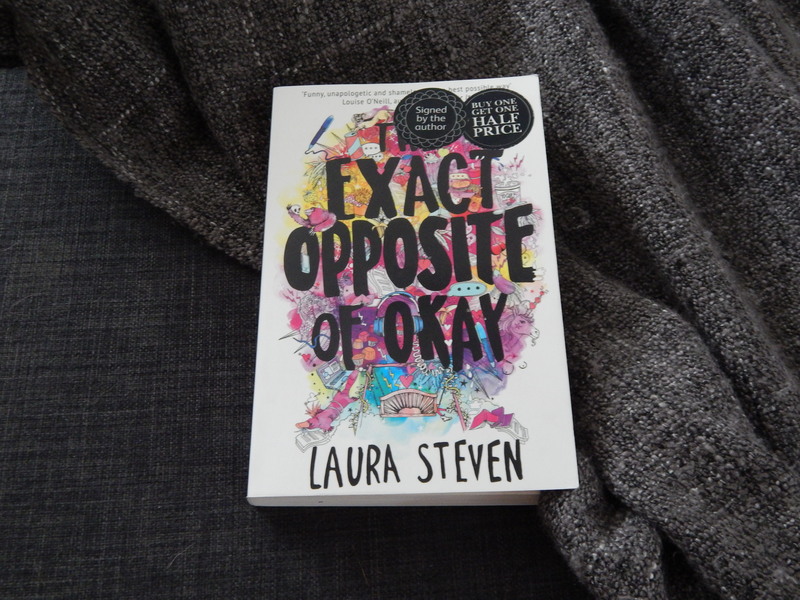 The Exact Opposite of Okay actually came onto my radar at the Northern YA Literary Festival, when Laura Steven introduced the Feminism in YA panel. She was witty and wonderful and I immediately decided that I had to read her novel. I just had to. Unfortunately, I am the absolute worst and poor old The Exact Opposite of Okay was purchased and swiftly lost in the mountain that is my TBR pile. Weeks passed before I finally picked it up and immediately devoured it. This book was everything I had been promised and more. I fully understand why my fellow Northern Book Bloggers were mad that I had neglected it for so long. I’m mad that the entire world hasn’t yet read this book. The only solution is to shout about it on the internet in the hope that I can convince someone to pick it up and fall in love with it too. As you’ve probably guessed from the summary, The Exact Opposite of Okay isn’t all humour. Sure, Izzy is hilarious (and I desperately want some more books about her please and thank you ) but she also has to put up with some pretty awful stuff. With a real mastery of her craft, Laura Steven has written a book that makes you laugh, reminiscence and want to reach through the pages to stand with Izzy O’Neill. That’s a pretty hefty punch for a little under 350 pages. This book just drew me straight in and stayed with me for a long while after I finished reading. It is truly, wonderfully potent. Before I send you off to start reading it for yourself however, this book does come with a PSA: don’t read it on the train. You’ll be full on belly-laughing in public and getting some weird looks. And yeah, I thought it was hilarious too, lots of laughing out loud in amongst the outrage.